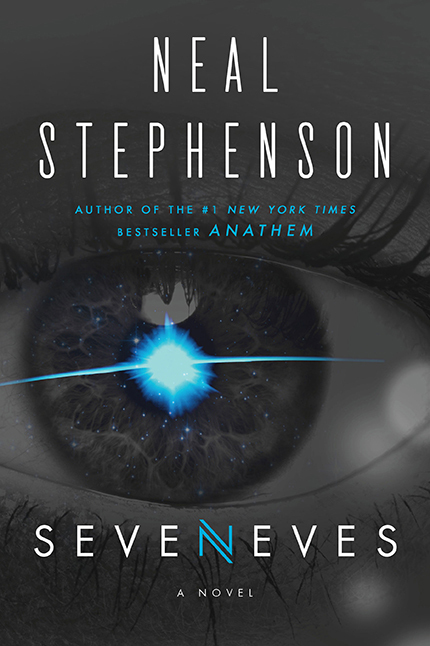 SEVENEVES is a very old project; I first started thinking about it when I was working at Blue Origin, probably circa 2004. The kernel around which the story nucleated was the space debris problem, which I had been reading about, both as a potential obstacle to the company's efforts and as a possible opportunity to do something useful in space by looking for ways to remediate it. Some researchers had begun to express concern over the possibility that a collision between two pieces of debris might spawn a large number of fragments, thereby increasing the probability of further collisions and further fragments, producing a chain reaction that might put so much debris into low earth orbit as to create a barrier to future space exploration. Having been raised on the idea of "Space, the Final Frontier," I was both appalled and fascinated by the possibility that it might instead become an impenetrable ceiling only a hundred or so miles above our heads. As I began thinking about how to develop that into a story, I made up my mind that I would keep it close to Earth--or at least, within the solar system--and that I would avoid the use of faster-than-light propulsion systems or other technologies for which there is no known physical basis. While many fine science fiction books have made use of such ideas, my own bias is that interstellar travel is probably overrated. We're not leaving the solar system any time soon. If we managed to travel to a "nearby" star--a preposterously difficult undertaking--we probably wouldn't find much. The same level of effort expended on or near Earth, however, gives vast scope for possible adventures. The third element that made its way into the story is the concept of aliens. Science fiction writers have dreamed up many kinds of aliens, some of them fantastically imaginative, some so profoundly different from us as to be nearly incomprehensible. But the aliens that have stuck with us in popular culture have been English-speaking humanoids. In some cases, as in Star Trek, these are so similar to us that we can even breed with them! The subtext seems to be that the aliens are us; we are the aliens. Fine. Just another reason we don't have to develop faster-than-light drive. How all of these ideas find their way into SEVENEVES can't be revealed here without completely spoiling the story. The basic elements of the world were fixed a long time ago, and for at least eight years I have been roving around pitching it to various people in various media: television, movies, games, and various "transmedia" combinations. In the autumn of 2013, however I decided to just sit down and write it as a novel: the one thing I know I can get done. Because it was a mature concept already, this went quickly and I was able to deliver it to Jen Brehl at HarperCollins about a year later. The only part that gave me any trouble was calibrating an ending that would leave the reader satisfied that the story had concluded while leaving the impression of an open-ended world. No doubt opinions will vary on that, but feedback from early readers has been good and so I hope that many people will enjoy the result when it is published in May of 2015.